Since my iguana has been growing, I realized that I was going to need more leaves. 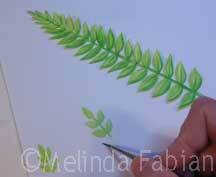 So this week, I have been painting up more leaves. This week I felt a bit like Goldilocks from the popular children’s storybook, Goldilocks and the Three Bears. It has been a bit of a challenge trying to find a shadow box picture frame that my 3D paper sculpture iguana would fit into. Every time I found another frame it was — no, this frame is too small; no, this frame is too thin; no, this frame is too big. And finally, the fourth frame I found is… just right! Initially, when I started working on my iguana painting, I thought I had the right size shadowbox frame already on hand- a wooden 8” x 10” x 1.5” deep shadowbox frame. I imagined the iguana would come out of the paper about an inch or so, making that frame a perfect fit! Well, I am in the middle of this project, and realize, he is developing and growing in size! So, I started searching for other sized shadow box picture frames. I purchased a couple different frames–each one deeper than the previous one! I couldn’t find another 8” x 10” frame that was deep enough where the glass wasn’t bumping into the poor little iguana’s head. Now he is about 3 inches in depth. Alas, a frame the iguana will fit into! I had to move up in frame size-from an 8” x 10” to a 10” x 14” x 4” inch frame.